Find entry points around the home. They might be cute and fuzzy outdoors, but when you get squirrels in the attic or walls of your home, serious harm and injury can occur. Squirrels can cause damage to your house in places that are very difficult to reach, meaning lengthy and costly repairs. Further, they can transmit quite a few diseases, so an encounter with a frightened and trapped wild animal in your home could spell disaster for you and your loved ones. That’s why it’s important you not only learn how to get rid of squirrels in the attic but also how to keep squirrels out of attic spaces. 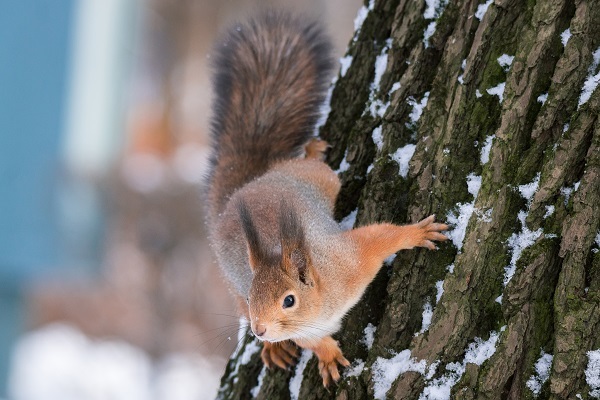 Here are five effective steps that will help make your home squirrel-free and practically impenetrable to these long-tailed invaders. Seal up all entry points except one. Squirrels can squeeze through just about any opening in your home, so make sure doors and windows are properly fitted to your house and covered with fitted screens. Wire mesh can be placed over open vents and chimney tops (or you can invest in a chimney cap). Seal up other openings with caulk, steel wool or appropriate materials as needed (e.g., fill up holes with dirt, use bricks to fix a wall, etc.). A pest management professional can help suggest ways to shore up your home’s defense. Just remember to always leave one entry point open so the squirrels can leave on their own. This should be the most obvious and accessible entry point. Cover this last entry point with a single sheet of newspaper, and if it’s still intact a few days after you stop hearing signs of squirrels in the attic, it’s safe to seal it off for good. Give the squirrels some incentive to leave. Unfortunately, you might have to learn how to get rid of squirrels in your attic by giving them a little push. Squirrels won’t always leave on their own, especially if they’ve already given birth to a litter. In this scenario, the adult will repeatedly leave and enter the home to bring food to the young. If you seal up the final entry point when the adult squirrel leaves while the baby squirrels are still in the attic or walls, they will need to be removed by a pest management professional, dead or alive. To prevent this, drive the squirrels out as soon as they make themselves known before they can give birth or set up shop. Playing loud music and keeping lights on can be effective as a squirrel repellent. Attics should be avoided while squirrels are in them since they can be dangerous and may even get scared and run into other parts of the house, creating a path of terror and destruction along the way. Learn how to get rid of squirrels in the attic with traps. Traps are a very effective weapon in the war against squirrels in the attic. There are a few different types of squirrel traps that you can use, as well as a few different places to set them. Live-capture traps do just what their name sounds like: captures the squirrel alive. Unfortunately, you will still have to deal with the live animal after trapping, either through euthanasia or setting it free 5 or 10 miles from your home. This is dangerous to both you and the squirrel and may require a permit based on your state’s wildlife laws. Kill-traps are actually more humane than live traps and much safer since the rodent will be taken out of the equation quickly and safely. Live traps also have to be checked frequently, as it is inhumane to let the animal starve to death. Both of these types of traps (kill- and live-capture) are typical ‟box traps” and can be placed in attic runways where squirrel activity has been noticed. The third type of trap is called a ‟body-gripping” trap and can be placed directly outside of entry points to catch the squirrel as it darts in and out of your home. Box traps can also be placed outside in the yard, near burrows, to capture squirrels before they can enter your home. Learn how to keep squirrels out of attics and your home in general. Finally, it’s vital that you take preventative measures to keep not only squirrels but also pests in general, out of your home. Insects, arachnids, wildlife, and reptiles belong outside in nature (unless kept as pets), so start by sealing up entry points around your home (discussed above). Trim any trees that overhang your house, as squirrels and other pests can gain easy access to your roof, windows, and attic. If the squirrel population around your home is a problem, use traps to alleviate it. Take necessary precautions if you have children or pets, as they can get caught in the traps as well. By far, the best way to deal with squirrels in attic spaces, walls or around the home is to call a pest management professional. A professional from Summit Environmental Solutions not only knows how to get squirrels out of the attic, but how to keep them – and other pests – outside where they belong. Call 703-520-5868 today and put a safe ending on this potentially dangerous situation.